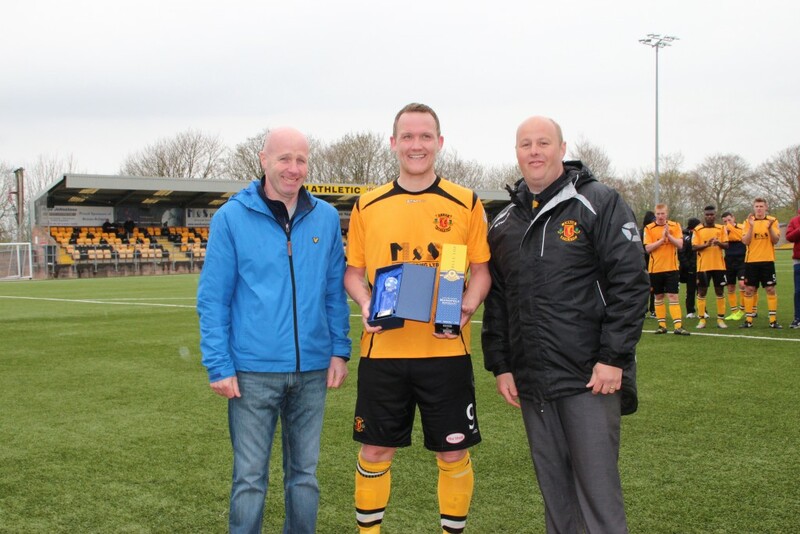 Annan Athletic striker Peter Weatherson won this seasons vote for the supporters club player of the year. He was presented with the award after Saturday’s match by Brian Sutherland and Ross Johnstone. Peter missed the majority of last season through injury and only returned to action 6 games into this season but wasted no time finding the back of the net again, scoring on his return against East Stirlingshire. He’s grab two hat- tricks lately and found the net 25 times for the club, with 22 league goals putting him top of the list in the SPFL. He’s also reached international recognition and featured on Sky’s Soccer A.M for his spectacular half way line goal at Elgin last week, available to watch in our TV Archive. Hear his reaction to winning the award by clicking here.